UN Emergency Relief Coordinator Valerie Amos (left) meeting with survivors of Super Typhoon Haiyan (local name Yolanda) in the battered Philippine city of Tacloban. As the United Nations and other organizations scale up the massive relief operation under way in the typhoon-battered Philippines, the UN humanitarian chief is meeting today with survivors in the hard-hit city of Tacloban, a day after launching a $301 million flash appeal for lifesaving aid. UN Emergency Relief Coordinator Valerie Amos has been in the region since category 5 Typhoon Haiyan made landfall over the weekend, surveying the damage and meeting with aid workers battling heavy rains, blocked roads and damaged airstrips and seaports to reach millions across the region desperate for food, water and other basic necessities. Offering a sobering snapshot of the situation on the ground, Bernard Kerblat, UN refugee agency (UNHCR) representative in the Philippines told UN Radio the because at least eight regions are logistically cut-off, information is trickling in “piecemeal” and hampering aid. “I’m afraid that even if it’s day five of the crisis and even if everyone is working around the clock, we still don’t know the full extent of the picture,” he said. “As I speak to you, dead bodies are rotting on the side of the street, and that is Tacloban,” said Mr. Kerblat. At least 9.4 million people have been affected, according to figures he cited, with more than 600,000 people displaced, the majority of them in evacuation centres. With much of the telecommunications infrastructure also destroyed, the UN International Telecommunication Union (ITU) deployed dozens of satellite phones equipped with GPS to facilitate search and rescue efforts, along with other equipment to help families re-establish contact. “Our aim is to ensure that the national and international humanitarian community has reliable access to telecommunications to enable them to serve affected people and save lives,” said Brahima Sanou, Director of the Telecommunication Development Bureau at ITU. The equipment can be charged by car batteries and is also supplied with solar panels to enable operation during power outages, the UN agency highlighted. ITU experts are also on the ground, working with authorities to train first responders on how to use the equipment. Meanwhile, the UN Children’s Fund (UNICEF) today appealed for $34 million to aid the four million children affected by the typhoon over the next six months. 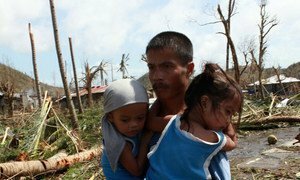 The UN agency is particularly concerned about the 100,000 children under the age of five and the 60,000 pregnant or nursing women displaced by the typhoon. Water, sanitation and hygiene services have been almost completely wiped out, with pipelines flooded and lack of electricity making water pumping and treatment impossible. “With every day that goes by, thousands of children are becoming weaker, and more vulnerable to disease,” said Tomoo Hozumi, UNICEF Representative in the Philippines. The United Nations today appealed for nearly a third of a billion dollars to provide humanitarian assistance to typhoon hit regions of the Philippines where aid workers are labouring around the clock to get in urgently needed survival supplies, such as food, clean water, shelter and basic medicines.